I've been doing some organizing of my cards, cuz frankly, they need better organization. The stack of minis was just waiting for me to knock it over. Considering I picked up some sleeves a good two weeks ago, I have but myself to blame for taking until now to put them where they rightfully belong. In the sleeving of the minis, I did some reordering of the cards, getting the same backs together, and the subsets. Even put all the minis that are sideways together. Oh - I am talking 2012 A&G if you haven't figured it out. Anywho - found I have one no number back mini. Devon Meroraco. Yeah, exactly what I said. 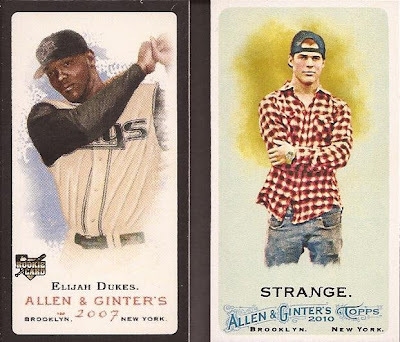 So I took the time to go back through all the other Ginter minis and see if I had any other no number backs. I know I had a Bazooka back, but danged if that is MIA. But sure enough, I do have two other no number minis in my binder, and that is where this call to arms comes from. First, a gander at the backs, shall we? Click them if you want the full size - I didn't reduce them. But if you ask me, both of those are no number backs, correct? Good - then I am not blind. 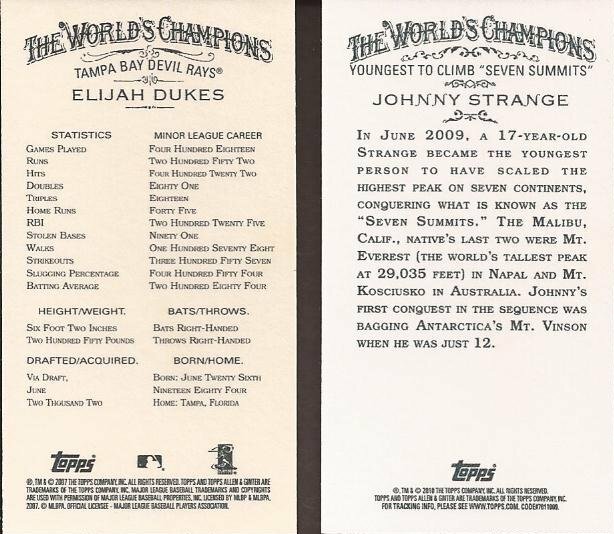 Ok, here comes the really confusing part, and I'll start by showing the front of the cards. 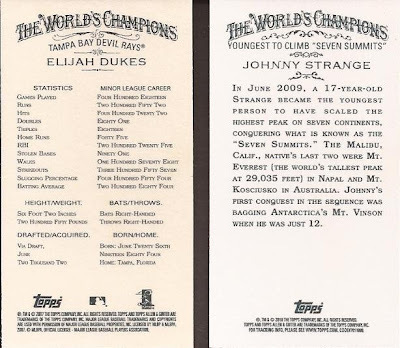 So we have a 2007 black border Elijah Dukes (see my Meroraco comment above), and a 2010 Johnny Strange. Sweet they have no number on the back, but from my research, something isn't right. I know the 2012 mini no numbers are short printed to just 50 of each. I wanted to see what the short print number was for these two years, and damned if I found some confusing info. I first found this article talking about the 2007 minis. In it, they state the the no number mini has a normal back. Ok - mine does. But the very next paragraph talked about the black bordered minis. It makes no reference if the no number minis are normal front or black border front. My thinking is if they were related (no number back on black border), there would be some statement of that fact. Nope. Moving on to the 2010 mini of that Strange dude, this article says the no number minis are serialed to /50. Check that card out. There is no serial number printed anywhere on it. Go ahead, look it over a few time. Nothing. So......WTH? And my call goes out to you whom are reading. If you have a link telling me something I can't find, send it. If you have a clue to what I am missing, enlighten me. If you have a good joke, I better frigging laugh.